Early last year, Steven Soderbergh shocked the film world by announcing his retirement from directing — although, to be fair, he'd been hinting at leaving movies ever since 2009, so really, we all should've seen it coming. Still, no matter the preparation, hearing that one of the biggest directors in Hollywood was quitting film still felt like a major surprise, and not a particularly good one; Soderbergh, the man behind movies such as Magic Mike, Ocean's 11, and Erin Brockovich, is responsible for some of the most entertaining films of the last few decades. Yet those who worried that Hollywood wouldn't be the same without him shouldn't have, because, as it turns out, Steven Soderbergh has no idea how to retire. Sure, the actual production occurred before Soderbergh's retirement, but since the movie came out afterwards, we're counting it. The HBO film, about the last years in the life of Liberace, was hugely acclaimed, both for the lead actors' performances and Soderbergh's direction. In September, he won the Emmy for Best Director. On Monday, Amazon greenlit Red Oaks , a TV pilot produced by Soderbergh set for a fall premiere. A comedy about a 1980s' college student/tennis pro (Craig Roberts), Soderbergh is co-producing with David Gordon Green, Gregory Jacobs, and Joe Gangemi. In April, Soderbergh directed Chloe Grace Moretz in The Library, an off-Broadway show about the aftermath of a school shooting. The play received mixed reviews, but Moretz' performance as an injured teen won raves. For some unknown reason, Soderbergh decided in February to mash up Alfred Hitchcock's and Gus Van Sant's versions of Psycho into one feature-length video, called Psychos. Well then. 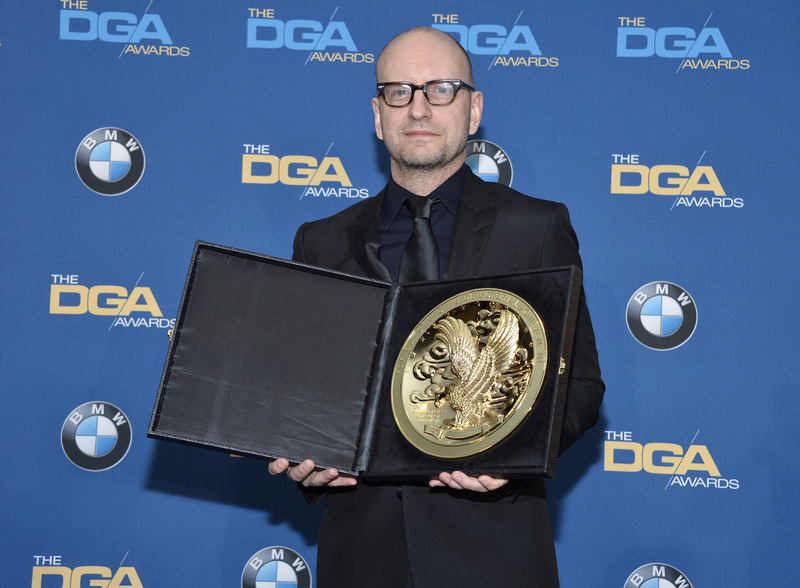 In March, Soderbergh announced that he was planning to import Singani 63, a Bolivian liquor, into the United States. He'd first been introduced to the drink in 2007, and had been a big fan ever since; currently, he's fighting with the U.S. government to be able to sell it out of New York State. Labeled "a one-of-a-kind marketplace from Steven Soderbergh," the website contains clothing, photos, writings and more from the filmmaker. Recently, he took to the site to pay tribute to the late cinematographer Gordon Willis; before that, he posted the re-cut of Psychos. August will see the premiere of The Knick , a 10-episode TV show starring Clive Owen as an early-20th century doctor and directed/co-produced by Soderbergh. In Esquire, he said that he's "really happy" about this project, and was excited about moving to TV after so many years in film. Called Heaven's Gate: The Butcher's Cut , the feature-length film is Soderbergh's version of Michael Cimino's 1980 epic Western, Heaven's Gate. In April, Soderbergh, under his much-used pseudonym Mary Ann Bernard, introduced his self-labeled "obsession" to the world on Extension 765. Last May, Soderbergh tweeted out a novella called Glue , a crime story told in a series of short, terse sentences spread out over the course of a few days. You can buy the full book on — where else? — Extension 765. He may not be its director, but Soderbergh, according to a May GQ profile of Channing Tatum, is still going to be very much involved in Magic Mike XXL. So far, he's a producer, the camera operator, film editor, and the director of photography, and we wouldn't be surprised if a few more titles come his way by the time the movie actually starts filming.